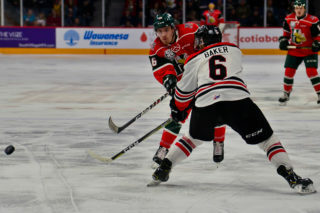 The Halifax Mooseheads played a solid game on the road Saturday but came up short in a 3-2 loss against a tough Baie-Comeau Drakkar team. Alex Gravel was outstanding with 37 saves and was named the first star of the game despite the loss for the Herd. Halifax dropped to 5-2 and Baie-Comeau improved it’s QMJHL-best record to 7-0-0-1 thanks to a clutch goal from Yaroslav Alexeyev with only 1:53 remaining in regulation. 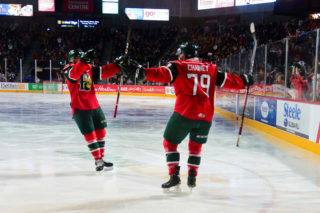 The former first round CHL Import pick increased his league leading goal total to 10 when he snapped in a one-timer from the slot on a set up by Ivan Chekhovich and the third star Gabriel Fortier. Gravel did everything to keep the Moose in the game, especially in the early going when he made 18 saves in a scoreless first period. Raphael Lavoie opened the scoring at the 6:36 mark of the middle period when he put a high shot over the shoulder of Kyle Jessiman after carrying the puck out from the boards and toward the crease. 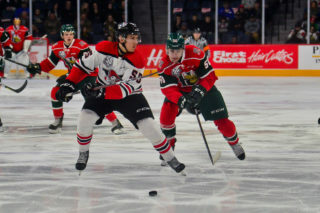 The Drakkar bounced back with two goals within the next five-and-a-half minutes from Samuel L’Italien and D’Artagnan Joly to get the crowd of 1,903 amped-up even more than they already were for the battle between the two rivals. 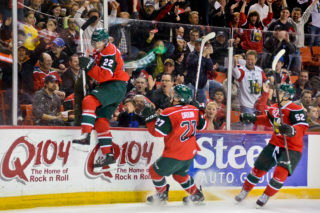 2-1 is where the Mooseheads and Drakkar stood after 40 minutes of play. Halifax picked up the pace in the third period and came up with a number of great chances. Xavier Parent scored for the second straight night and tied the game 2-2 by finishing off a drive started by Benoit-Olivier Groulx when he ripped in a loose puck in front of Jessiman. The clubs went back and forth with both goalies making key saves until Alexeyev came through in the clutch in the dying minutes. 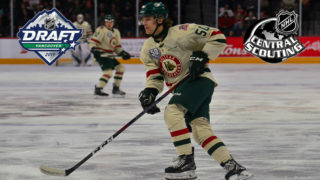 The Mooseheads were once again without the injured Ostap Safin, Joel Bishop, Samuel Dube, Kyle Petten and Jared McIsaac. The Herd will return home on Sunday before travelling to Charlottetown, Saint John and Acadie-Bathurst next Thursday, Friday and Sunday.